There are 40.000 taxis in Buenos Aires city, and most of them are driven by good people, and I tell you this not only as local born here but also as a Private Tour Guide for Buenos Aires that takes between 6 to 7 taxis per day. Anyway, as you always have an exception there, here goes my advices and info. You will read a lot of bad experiences in the forums, so at the end of this section, you can check about the other side. How do the taxis charge? From/to Ezeiza, they charge a fee which usually is US$ 45 from Ezeiza to Buenos Aires downtown and US$ 30 from downtown to Ezeiza. This should include any expenditure like tools or parking, anyway if you hire in advance, and then you remain more than an hour after the landing of your flight, the driver may charge you for the extra time (Usually US$ 25 per extra hour). ADVICE: Take taxis previously arranged inside of the airport. I can help you with this, or do with any other company, but is very important to hire the taxi previously or at least INSIDE of the airport. In Buenos Aires, they use a timer. d. If the taxi goes out of Federal District, the driver could ask get paid the return of the trip, which means you should ask before in case you want to go out, by example, to go to Tigre or San Isidro. Always is better to deal a rate instead of use the timer. 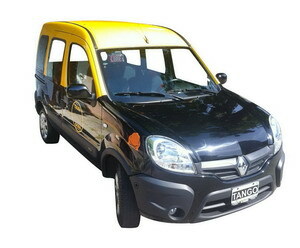 RADIO TAXIS will charge around $arg 20,00 for go to pick up you. For this estimations I also used the support of this website: www.ViajoEnTaxi.Com.ar is working with day rates, unluckily is not using the english version but you can easy use the map or write the adresses. All the taxis in Buenos Aires (not those of Ezeiza airport because that area is out of the city) are black with a yellow roof. My suggestion is to always take radio taxis, which are those with identification in the back doors and some times also in the roof. In case we met, I have other personal options that could be used in case you decide to take a tour with me. Meanwhile the legal arguments run against many apps and transport systems, the city launched an App you can easy download, named BA TAXI. Bellow is the logo and you can look for it as in the Apple Store as in Google Play. May be other apps or transportation methods but until today this is the only legal app available. If you are in a restaurant, shop or a hotel, you can ask the concierge or the casher there to call a radio taxi for you. If you are by your own, you can look for a light and when the many taxis we always have in the streets stops, you can check if they deserve to a radio taxi company and also check if you will feel comfortable. You will always travel better in a clean and new car, and probably you will get less choices of get a problem there. In Buenos Aires, you don't leave the car for pay, you should remain in the seat while you pay and you only leave after getting your change. This is the way we do, and it is safer for you be sure you will get your change!! Try to pay with the accurate amount, if you need to break a 50's or 100's pesos, always show to the driver the bill you are giving to him, in order to avoid any scam like get back to you with another fake bill which is not the one that you originally brought to the driver. Tipping is nice but it is not a duty, anyway according to the cheap rate of the taxis and that you will probably will no need as the driver the coins, is considered nice to round the coins and deppending on was the trip, a little bit extra, 5% in short trips, 10% in long ones. A GOOD EXPERIENCE: This is not the only good experience I've got, but it is just a sample to reafirm that most of the taxi drivers are good people, THIS-IS-ARGENTINA, so nice things about human behaviour happens! : One of my Customers of Private tour guiding in Buenos Aires, forgot an expensive i-phone in the taxi. We were in a cafe, so I insisted him to wait for the return of the driver but this Customer refused, convinced that the i-phone was lost. I gave to the waiter my business card just in case, and guess what, the next day this waiter called me with the number of the driver. This driver wasn't sure about in which coffee we had been, so he spend arround an hour of his precious time looking for us and asking, till he found our waiter. Moreover, the person who found the i-phone was another turist that offered him US$ 200 for the phone, but this trusty person refused and perservered looking for the owner. So dear reader, relax, trust, and enjoy, you are in a Friendly country, the best country of the World. Do you know that Buenos Aires is the city with most American inmigrants?